Alright, as promised yesterday, I have an awesome giveaway for my readers today. In case you’re wondering, yes, it is the Online VISION Special Edition Calligraphy Set which has been launched to commemorate SG50, Singapore’s 50th birthday! The sets are disappearing fast, but I’ve managed to secure 2 sets to be given away, thanks to the very supportive sponsorship of Fook Hing Trading Co. The VISION Calligraphy set consists of a pen with 3 italic nibs of different sizes: 0.8mm, 1.4mm, and 1.8mm, which can be fitted onto the brilliant red body of the VISION fountain pen. The pen itself has a red barrel, the colour of the red of the Singapore flag. It is made of aluminium with a brushed surface, and on it there is a diamond-engraved map of Southeast Asia, featuring Singapore as the star of the region. 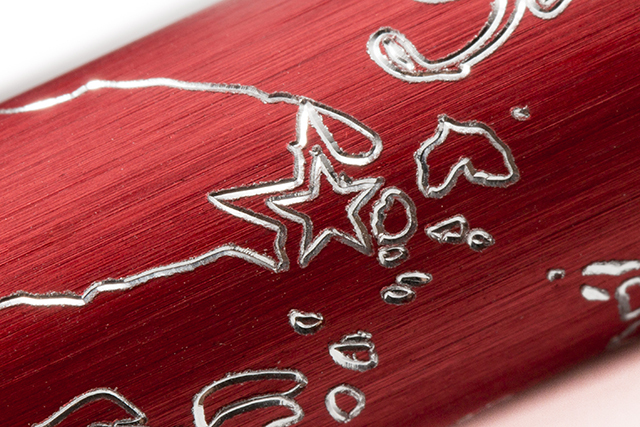 The pen comes together with a chrome cap with the SG50 logo engraved on it. There is also a 15ml bottle of Rubin Red ink included – “Rubin” being the German word for “Ruby”. The ink is of a bright red hue. The packaging of the product is very attractive – in contrast to the metallic material of the pen, the box is actually made of bamboo, which I personally find very tasteful and interesting. 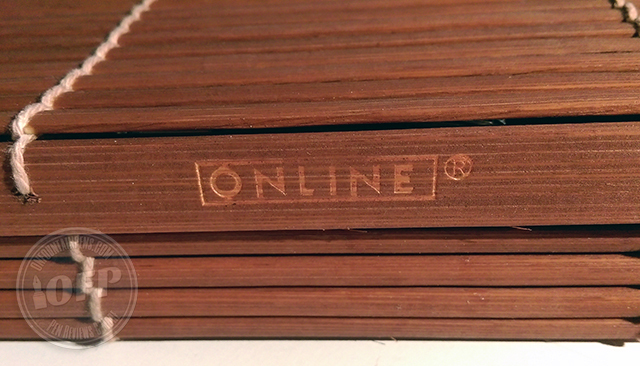 The closure is magnetic and has the Online logo engraved on it. It retails for SG$50. To register your interest for a chance to win one of 2 sets of the Online VISION SG50 Calligraphy set, use the Rafflecopter widget below and provide all necessary information. Also, leave a comment on this blog post telling me what you like about the product – this is mandatory! *Note: if you haven’t subscribed to OFP, perhaps it’s time to do so – enter your email address in the subscription field in my sidebar! This giveaway will end on 27 July and 2 winners will be picked! The packaging on this product is so eye-catching! Thanks for the chance! I just turned Two Score ands Ten so a birthday present in the form of an Online VISION SG50 Calligraphy set would make a nice present. What a beautiful pen! and thanks for the giveaway. Wow, beautiful pen! Thanks for the giveaway! Thank you for this great chance to win the beautiful set. The Pen! The Nibs! & Red Ink! Love the look of this pen and the red is beautiful. Very beautiful set! Thanks for the giveaway! Beautiful pen set! Definitely want! This looks fabulous – and it;s red!! This pen is freakin’ cool! Love all the design elements that homage to Singapore. I’ve been wanting to experiment with calligraphy and this set would make it easy to have what is needed. Very attractive presentation also. Thanks for making it available for the giveaway. Thanks for the giveaway. I like the engraved map! I do love a brushed finish. Congrats on SG50 Singapore! Looks really beautiful! 😀 Great giveaway too. been looking for a 1.8mm nib and this 3 in 1 would be so timely! The unique grip and quality red ink are superb. Have yet to try an Online pen, this looks great! Thanks again for hosting such an awesome giveaway! I love your posts and reviews, always so thorough and entertaining. This is very nice.. Thanks for the opportunity! The interchangeable nibs are the most interesting feature of the set. Add to that its scarcity and the whole bundle comes together nicely. I’d love to practice my calligraphy with this set. Hopefully I (and another lucky winner) will be able to. Thanks for the giveaway! Would love to try this beautiful set! I would love to get my hands on this set! Great giveaway! I really hope I will win one of the sets pls!! Wow ! What a wonderful calligraphy set ! Thanks for offering this awesome giveaway. This is awesome pen. I wish I could win one of these. I have heard great things about this brand. I have not had the chance to try them out yet and would love to win this set. Thank you for an amazingly awesome giveaway! Very nice set of color with matching box! Like the ink color with the red fountain pen! Nice looking pen set, thanks for the contest! Fantastic giveaway and the lucky winner will have lots of fun practicing their calligraphy. My dad would love this lol. What’s special about it is obviously the fact that it’s unique and limited edition! I’ve never had nibs beyond F or M before, but I have been dabbling in “fancy writing” (I don’t think it deserves to be called “calligraphy” yet) with my springy pens. I’d love to try the wider points, and the barrel is awesome! I like the interchangeable nibs as well as the box it comes in. Looks great! I haven’t tried Online pens. I think it’s great that it is a commemorative and special edition set. What a beautiful set! I so enjoy calligraphy and am a big fan of Online pens as well. This would be a treat to write with! The set looks cool and has a nice selection of nib sized. OMG FANFIRL FEELS !!!!!!! Super perfect pen!!!!!! *hyperventaliting!!!!!! * I love this pen omgggg!!! It’s a beautiful pen set so I love everything about it, especially the lovely red ink. It looks really grand. Would love to have one. beautiful set! would love to participate in the giveaway. Omg SG50 commemorative set! WANT!!!!! Great raffle!!! Here’s throwing my hat in. Wow of all SG50 commemorative items, this is the one that I actually really want to have! want! sg50 definitely deserves a pen on its own! Good luck to everyone! This product is selling out really fast, so grab yours quickly. Nice calligraphy set, I found this giveaway through a friend on fb and figured I’d join. Cheers. I love how the nibs can be switched, and apparently they write smoothly! Looks lovely. looking forward to review the set! I would just love to in this! This is all about the RED! I love the red red color of the pen barrel which signifies our Singapore Flag. I love the way the pen is presented in a neat bamboo box; coupled with Rubin Red ink and most importantly, I have been wanting a Calligraphy Set!!! Give me Give me!!! Wow this is a really awesome giveaway! My favourite part about this set is the unique sizes on the nibs! I would love to try that out. That is an awesome set. I would love to learn calligraphy! Thanks for the chance to win. The design and ink is really pretty! I hope to win this pen set. I’ve never used a caligraphy pen. This would be a first! 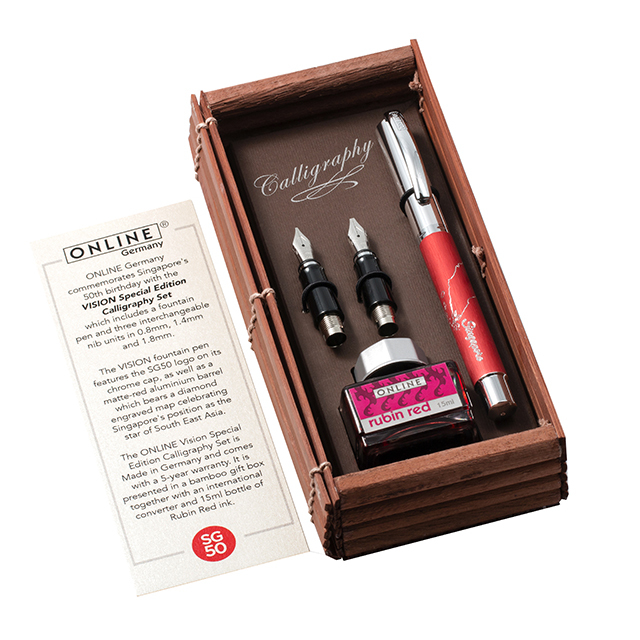 There is a lot to like here: the special edition, the engraving, the box, and the ink are all great, but I am most interested in the three calligraphy nibs. Thanks for the chance! It’s a great commemorative calligraphy pen, which would be a great addition to my collection to pass on to my son. Can’t resist a calligraphy set as good looking as that! It was a Schaeffer set that introduced me to fountain pens as a kid. Awesome! Recently fallen in love with italic nibs after using FPs for a year. And an SG50 commerative set as well,a must-get for any Singaporean! I think I didn’t buy the Online ink in Taiwan last week because I was waiting for this subconsciously! I want please! Lovely red special edition! Seems a nice, compact size, and celebrates a beautiful country. Interchangeable calligraphy nibs are a fantastic feature. Looks like a great set – thanks for the giveaway! Awesome! Just learning calligraphy and would love this! Looks like a good set for trying out various nib widths. Also a nice collectors piece for this year! Fingers crossed I get lucky on the giveaway! Wow, who would have thought your surprise was actually something this good? I didn’t pay much attention to the Online brand but with such a good offer, who could resist? I WANTTTT!!! I like the fact that it comes with 3 diffwrent nibs to swap around so we cam always choose rhe right one to use, and also that it is a SG50 commemoration product. Lovely red colour on the pen as well! Wonderful way to celebrate sg50 🙂 and it’s a beautiful set! What a generous giveaway! I’m a follower via email, where I learned of the giveaway. I love calligraphy pens but wow, that box is awesome and really adds a special touch, so that’s probably what I like best about this. Looks awesome! Even the box is cool. Great bonus for your supporters! I enjoy the blog. I love this giveaway! I hope I could win my first pen…good luck! Nice piece, Maybeliine! I will want to participate in the giveaway…regards. Hi Tommy, if you follow the Rafflecopter widget, the mandatory action is listed first. I like the style and color, plus the calligraphy nibs available with this pen. 🙂 Looks like an awesome set.